Did an early biosphere exist on the Red Planet? And if so, is it still there? In a new paper published in the Journal of Geophysical Research: Planets, Sean McMahon from Yale University and colleagues present a “field guide” for scientists engaged in the search for putative fossils on Mars. 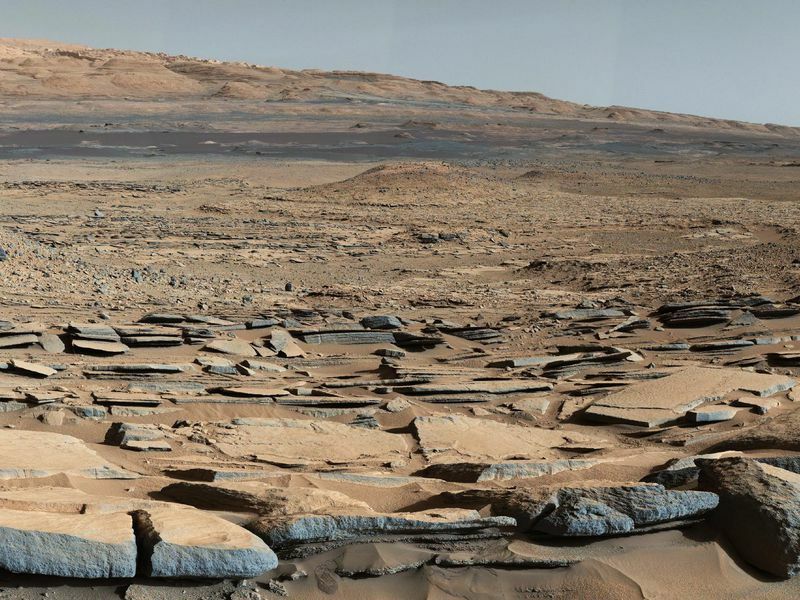 The authors believe the best place to look for fossils would be in mudstones rich in silica and iron-bearing clays that formed in the ancient lakes and rivers of Mars. Microbial life could also have been preserved in silica or calcite-rich hot spring deposits—although these have yet to be found on Mars—and possibly in salt rocks. Most of us associate fossils on Earth with the hard remains of shellfish or even bones. But because evolution on Mars most likely stopped with microbial, or at least small, organisms, and did not advance to complex life forms, finding the right environmental conditions for preserving soft bodies is a much more challenging problem. The search criteria proposed by McMahon and his colleagues are important, because habitable conditions are thought to have existed on Mars billions of years ago. According to one leading model by Alberto Fairén, now at the Centro de Astrobiología in Madrid, Spain, early Mars was cold and wet, not very unlike Antarctica today. In this scenario, dissolved salts in early Martian oceans would have kept water liquid even at subzero (Celsius) temperatures. In another scenario proposed recently by Ramses Ramirez of the Tokyo Institute of Technology and Robert Craddock of the National Air and Space Museum, early Mars may have been wetter and warmer than previously thought, perhaps more similar to the deserts of the American Southwest today. Scientists haven’t yet resolved which of these scenarios for early Mars is right, but either way, enough liquid water should have been present for microbial life to have gained a foothold. And once that happened, life probably was pervasive in Martian water bodies early in the planet’s history. The question of where to find possible fossils also affects our plans for missions to bring samples of Martian sediment back to Earth, as discussed at the recent 2nd International Mars Sample Return Conference. If there was an early biosphere on Mars—and we have many hints that this was so—could life exist there today, perhaps hunkering down in small environmental niches, still feeding and occasionally reproducing? It may very well be so. Once life gains a foothold on a planet, it can be hard to get rid of, not unlike the pests that invade your kitchen or bedroom here on Earth. Back to the Moon, Again: Will the Third Time Be the Charm?